The jobs carried out by printing presses in the flexible packaging sector are becoming more demanding due to the requirements and demands of the new products and formats that are continuously appearing for the different profiles of consumers. This reality means that our clients have had to settle in a state of continuous improvement, permanently optimizing their resources and processes. That is why at Comexi we are convinced that being aware and keeping up to date with everything that happens with the printing process is the key, the same way that we monitor and study our sports activities with the aim of improving and being more competitive day by day. Specifically, a tool that collects automatically and without any extra equipment all the data generated by machines such as flexible packaging printing presses, for further deep analysis. This is what Comexi Cloud offers. Graphs such as the simulated histogram (Fig. 1) make it possible to easily understand how the manufacturing process of a particular order has evolved, recording every step of the production process. This simulated graph reflects everything that has passed from the start of production order to its completion: print speed (in blue), meters produced (in orange), incidents (in grey) and finalization of reels, or each state of the machine as for example the mechanical changeover, adjustment and approval or production, among other data. In this sense, in the Fig. 1 we can see a simulated work of about 60,000 meters made with 4 reels, produced at a constant speed of 300 meters per minute and with a total amount of 8 incidents. All this information that is summarized in this intuitive graph, besides visualizing it in an agile and direct way, can be analyzed in detail and independently within the Comexi Cloud, in the various screens and visualizations that this tool allows. This innovative software allows analyzing, by means of indicators, each of the jobs, or in individual or in aggregate form. In this way the system provides the ability to study and improve concrete productive periods. In Fig. 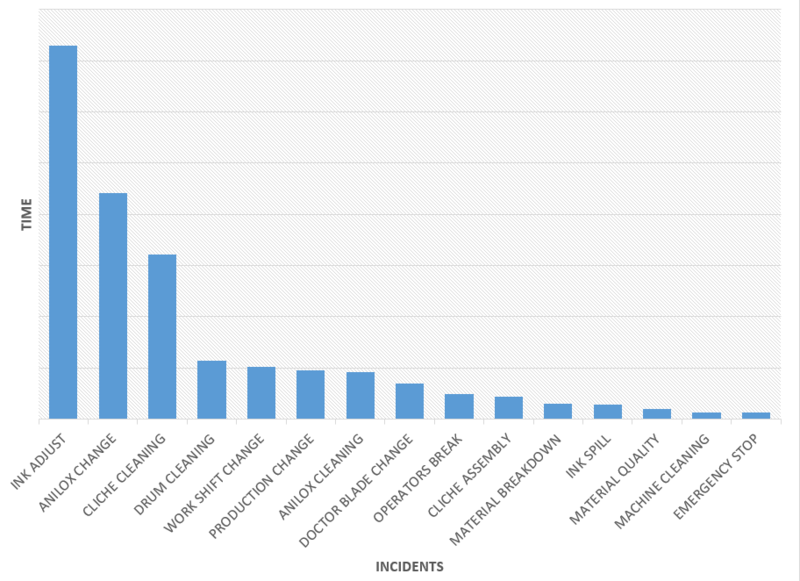 2 - Incidents, a study of aggregate incidences can be seen in a specific period of time. These data, as explained above, is collected and analysed by the Comexi Cloud platform where they are represented graphically for later study, thus enabling the possibility of focusing on continuous improvement solutions for the printing processes. What are the most relevant incidents that affect my production? How long does a mechanical change or adjustment take? What is the availability of the machine? What is being performed at this precise moment? These are just some of the many questions that can be answered with the Comexi Cloud; from anywhere and using any type of device. Being informed and checking the status of your production has never been easier.